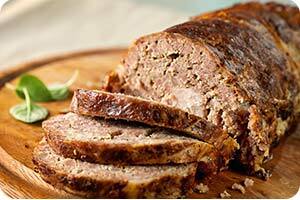 This moist, juicy gluten-free meatloaf is adapted from a recipe by Mark Bittman. It cooks well in a loaf pan or can be hand-formed. For variety, substitute ground beef and/or turkey for one of the meats. Especially good topped with slices of Organic Prairie Bacon. Heat the oven to 350°F. Beat egg and mix into milk. Add all other ingredients and mix together. Shape meat into a loaf in a baking pan (or pack into loaf pan). Coat loaf with barbecue sauce and top with bacon if desired. Bake for 45 to 60 minutes. When done, the meat loaf will be browned lightly and firm and an instant-read thermometer inserted into the center will read 160°F. Note: If you're not using barbecue sauce, baste loaf periodically with the rendered pan juices while it is baking.